This month SafeStart was recognized with the Outstanding Commitment to United Way of Hastings & Prince Edward Award for their 2017 fundraising efforts. Employee giving makes up more than 60% of United Way’s community campaign. The award acknowledges dedication and commitment to United Way and SafeStart’s workplace campaign had one of the largest employee contributions to the organization from companies with less than 250 people. This is the third year in a row that SafeStart has been recognized for their involvement and employee campaign success. 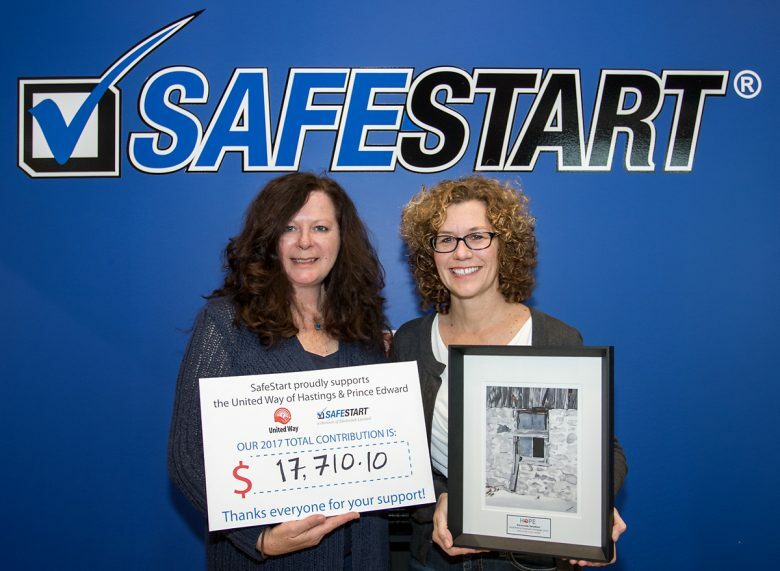 SafeStart raised a total of $17,710, their highest a donation to date, which includes payroll deductions, corporate donation and special events. As a Platinum contributor to United Way, SafeStart involves all of its management and staff in the fundraising efforts. Angie McConkey and Brenda Braund Pittman were recognized for their continued and dedicated involvement and presented with Ambassador Awards. These awards recognize those who organize campaigns that increase engagement, hold special events, and exhibit overall enthusiasm and commitment to improved results. SafeStart strives to help United Way surpass their goal for 2018. Everyone at SafeStart is proud to contribute to such a valuable organization whose sole purpose is to improve the lives of people within the community.